I finally had to spell it out for Tony: I travel to places in order to eat. I will not just blow through New Mexico so we can dawdle up Route 9 in Colorado, keeping an eye out for elk and deer. I would rather dawdle in Albuquerque and Santa Fe, searching out green chile burritos and sopapillas stuffed with carne adovada. At my insistence, we spent three days in New Mexico on our way to see Tony’s son, Nico, in Colorado. The route change was last-minute, after I explained I could not face another interminable drive through Iowa and Kansas, and certainly not Nebraska, which Tony thought might be worth a detour. What, you’ve never seen corn before? We made a quick stop in Albuquerque for lunch at one of my favorite restaurants, Sadie’s, which was a tad disappointing. The New Mexican food is still good, but it is not transcendent, as it was in the days before Sadie’s grew to three restaurants. Santa Fe the city disappointed me, too. What happened to that charming village square I remember from the 1980s? It is now crowded, kind of dirty, and basically Disney with howling coyote trinkets. New Mexican food, built on corn meal and green chiles, is unstoppable, though. Turns out one of the best meals we had was at a modern little cafe on a winding route known as the Turquoise Trail between Albuquerque and Santa Fe. The clientele at Cafe Fina appeared to be old hippies with a sprinkling of tourists. The food was handmade and the welcome was warm. Customers order at a counter, pour their own coffee, grab some tableware and take a seat. The food is delivered to the table. I had a simple Southwestern breakfast of migas — eggs soft-scrambled with chiles, salsa and tortilla chips. The tortilla chips, homemade at Cafe Fina, soften in the salsa, leaving bits of crisp edges for crunch. I shared bites with Tony as we read the local newspaper and sipped coffee. I think he’s beginning to understand the idea of food as a travel destination. When I make the following recipe at home, I buy good, fresh corn tortillas at a Mexican grocery and cut them into sixths, like a pie, with scissors. Then I spray the triangles with olive oil or vegetable oil spray and bake at 400 degrees until crisp. Beat eggs with cumin and basil. Set aside. Melt butter in a large skillet. Sauté onions and peppers until softened. Over medium heat, add egg mixture and begin to stir. When eggs begin to set, stir in cheese and tortilla chips. When cheese is about half melted, stir in salsa. Continue to stir until mixture is warm, cheese is melted and eggs are set. Season to taste with salt and pepper. Scoop onto plates and top with a dollop of sour cream and a couple of slices of avocado. Serves 4. A hamburger on a toasted bun with mustard, pickle, lettuce and onion and a hamburger with chlii sauce and cheese (lunch and dinner), chili-cheese fries from Vicco’s Charcoalburger Drive In (“Since 1953”) in Glenwood Springs, Colo.; huevos rancheros with two crisp tortillas, over-easy eggs, green chile sauce and sour cream at the Grand Ave Grill in Eagle, Colo.; Salvadoran pork-stuffed pupusa and a chicken empanada at Sal-Mex Restaurant in Glenwood Springs; stir-fried shredded pork and cabbage, beef teriyaki and coconut rice at the Ekahi Grill (Hawaiian food) in Gypsum, Colo.; bacon, eggs and pancakes at Village Inn in Glenwood Springs; chili dog and incredible batter-dipped onion rings at Vicco’s Drive In. Note: Vicco’s Drive In was a find. The burger patties were 1/2-inch thick, imbued with smoke, and served on buttered, charcoal-grilled buns. The modest, mid-century modern building (actually a hut with flying buttresses) is showing its age with vintage drive-up order speakers and sliding walk-up windows that appear to have been constructed during the Eisenhower administration. The place is always busy, but the wait for food shouldn’t be more than 10 minutes. If you go try the elk burger. I’ve been having a hard time finding pappardelle pasta at area grocers.. Do you or your readers know of any stores that carry it? Either fresh or dried is fine. Additionally, if it’s on the menu at any Italian eateries around here, I’d love to know about that as well. Thank you. Dear O.R. : The wide pasta noodles are available both dried and frozen at DeVitis Italian Market in the North Hill area of Akron. The dried varieties are Delverde and De Cecco and the fresh-frozen, Pastasa. The store is one of my favorite food destinations in Akron. While you’re there, snag a loaf of fresh (sometimes still warm) Massoli’s Italian bread, a homemade Italian sub for lunch, and house-made lasagne for the freezer. If not on the menu, I’ve certainly seen pappardelle in specials at Russo’s Restaurant near Peninsula, Papa Joe’s in the Merriman Valley and Vaccaro’s Trattoria in Bath. You could easily make your own, you know. In a food processor combine 1 cup flour, 1 tablespoon olive oil, 1 egg and a pinch of salt. Pulse several times. With the motor running, pour water in a very thin stream through the feed tube just until the dough clumps together to form a ball. After the dough rests for 20 minutes, knead it in a hand-crank pasta machine to make very thin sheets about 1 foot long each. Alternatively, knead it by hand for several minutes, then roll out until thin enough to see your hand through. Dust sheets of pasta with flour. Roll up like cigars. Cut 1-inch wide pieces and unroll. Cook in boiling, salted water until noodles float to the surface, about 1 to 2 minutes. Okay, maybe it would be easier to buy it. Winner of two James Beard Awards for food writing. I dug myself out of a rut last week by vowing to try a new Chinese stir-fry recipe that doesn’t start with my homemade spicy-hot stir-fry sauce. I love the gutsy flavors of Chinese chili-garlic sauce, sweet soy sauce, hoisin and all the other stuff I put in my sauce, but I wondered what I’ve been missing. Here’s what: Crunchy Chinese noodle cakes. Yeow. While I’ve been stir frying with my sauce, the noodle-cake recipe has been hiding out in my row of Chinese cookbooks. 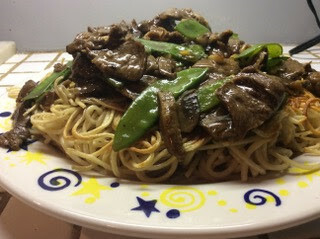 Last week I used the recipe from Nina Simonds’ “Asian Noodles,” in which she tops the crisp cake with thin ribbons of beef in a garlic-oyster sauce stir fry. Nina’s recipes are both reliable and reliably streamlined, although the whole thing in this case did take a couple of sessions in the kitchen. I boiled the noodles and made the marinade and sauce one day, and cooked it all the next. It’s summer and I didn’t want to spend too much time in the kitchen. I liked the garlic-oyster sauce stir fry (although I missed the kerpow of chiles) but I loved, loved, loved the noodle cake. Wheat noodles (thin spaghetti can substitute for the Chinese round, yellowish wheat noodles I used) are boiled until al dente, then drained very well and tossed with sesame oil. While warm, they are packed into an oiled, 9-inch-round cake pan. They are refrigerated until the cake is cool and the noodles stick together in a disk. Then they are fried on both sides until brown and crisp on the outside but warm and soft inside. I see many noodle cake variations in my future. I could pack the noodles into individual flan pans for single-serve noodle cakes. I could toss the boiled noodles with snipped fresh herbs such as chives before packing them into the cake pan. I could season the boiled noodles with at bit of, yes, my homemade Szechuan stir-fry sauce. See, I’m willing to climb out of my rut — but not too far. Make the noodle cake and keep warm in a low oven. Trim any fat from meat and cut into 1/6-inch slices. Make the marinade and the oyster sauce. In a bowl, combine the beef with the marinade, tossing to lightly coat. Heat a wok or heavy skillet over high heat. Add 3 1/2 tablespoons of the oil and heat until almost smoking. Stir-fry the beef slices until they lose their pink color and separate. Remove with a slotted spoon and drain in a colander. Wipe out the pan. Reheat the pan and add the remaining 2 tablespoons oil. When hot, add the mushrooms, garlic and ginger and stir fry for 1 minute. Add the snow peas and rice wine and stir fry for 1 1/2 minutes. Give the sauce a stir. Add to the pan and cook over high heat, stirring constantly until thickened. Add the beef and toss gently in the sauce. Spoon over the noodles and serve. Cook the noodles in boiling water according to package directions, until just al dente. Drain well. Add sesame oil and toss. Transfer noodles to an oiled, 9-inch-round cake pan and let cool. Heat a well-seasoned skillet over high heat until very hot. Add the vegetable oil and heat until almost smoking. Invert the noodle cake into the hot pan. Fry over medium-high heat, shaking occasionally so noodles don’t stick, until a deep golden brown on the bottom, 5 to 8 minutes. Using a large spatula, flip the noodle cake and brown the other side. Transfer to a heat-proof platter and keep warm in a low oven until ready to eat. What I cooked last week: Egg salad sandwiches. Shrimp sunomono (vinegared seaweed salad) from Sushi Katsu in Akron; fried chicken salad and one jo jo potato from Huck’s gas station in Mt. Vernon, Ill.; pork and green chile stew with flour tortillas, sour cream and guacamole at Michoacanos Mexican Restaurant in Chandler, Okla.; scrambled eggs and a biscuit with blackberry jam at the Cherokee Trading Post Restaurant near Oklahoma City, Okla.; sopapillas stuffed with carne adovada at Sadie’s in Albuquerque, N.M.; migas (scrambled eggs, tortillas and cheese), black beans, and a whole-wheat tortilla at Cafe Fina in Santa Fe., N.M.; chicken teriyaki sub from Subway somewhere in Colorado. I have given up buying fish. It all seems to come from China or thereabouts. Where do you buy fish? I have seen wild-caught fish labeled country of origin “China.” Even Alaskan-caught fish is questionable. And farm raised? Forget it after the feeding videos I have seen. I miss fish terribly. Once in a while a friend will bring us some from Lake Erie, but not often enough. Dear Carol: You make some very good points. I can’t recommend most farm-raised fish, either, and as someone who has sent supermarket seafood away for bacterial testing, I am leery of a lot of stuff in stores. The key is to find purveyors you trust. That’s why you wrote to me, right? Unfortunately, I have not bought much seafood in years because I’ve been eating pristine stuff Tony bought from a trusted sushi fish company. It does not sell to consumers, and our freezer supply is waning so I’ll have to address the issue soon. Pre-Tony, I trusted Mustard Seed Market and Bay Lobsters Fish Market, which has now moved to Wooster (baylobsterswooster.com). I would like to know where else people shop for seafood. Note I did not say “fresh” seafood. We who live in the nation’s midsection cannot expect to buy “fresh” seafood unless we know someone who drives to the coast, buys seafood off a day boat, ices it down and speeds back home. What I look for is fresh-frozen — that is, fish frozen on the boat right after it is caught, and transported still frozen to the hinterlands. Most stores thaw the fish before selling it, in which case you should use it the same day you buy it. If you must keep the seafood for even a day, try to buy stuff that is still frozen. By law, anyone who sells fish must have inspection tags with origin and safety information available for anyone to look at. So when you ask where the fish came from, you can also ask the merchant to prove it. The tags don’t have to be on the premises, but the must be made available. My major crops this year are Chinese eggplants and tomatoes. I planted about 12 tomato plants and have harvested at least a dozen ripe beauties, with many more on the way. I planted a dozen eggplant seedlings, too, and the plants are gorgeously robust. But the slackers have not produced a single flower yet, let alone an eggplant. The ratatouille cannot wait any longer. I crave the sunny flavors of eggplant, zucchini and tomatoes simmered with garlic and finished with fresh-ground black pepper. This year I gilded the lily by drizzling homemade pesto over the platter of vegetables just before serving. 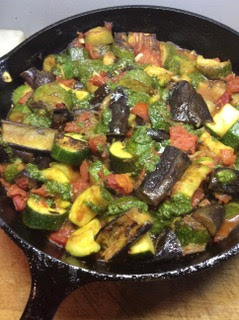 Even without the pesto, my ratatouille probably would not be recognized in southern France, the area of its birth. In the original, the vegetables are stewed until they softly melt into each other. I prefer more stand-offish vegetables that soften but keep to themselves. The following recipe is a riff on Patricia Wells’ version from “At Home in Provence.” I like her trick of adding liquid (in this case, tomatoes) to sautéed garlic to stop the cooking and keep it from burning. Long, thin Chinese eggplants are beginning to show up in farmers’ markets and even mainstream supermarkets. If you can’t find them, try an Asian market. They are worth searching out because they are not bitter, like globe eggplants can be. Even the skin is edible. Trim eggplant and zucchini and cut in halves lengthwise, then into 1 1/2-inch lengths. Heat 2 tablespoons of the oil in a large skillet over medium-high heat. Stir fry eggplant until it begins to brown on edges. Add zucchini and stir fry until almost tender. Add salt and garlic and stir fry until garlic begins to brown. Add tomatoes and vinegar and cook over high heat until tomatoes are soft and most of the liquid has evaporated. Stir in pepper. Remove from heat and stir in pesto. Serve warm, cold or at room temperature. Peeling and seeding tomatoes is not a chore I enjoy, but knowing the proper technique reduces the hair-pulling tremendously. There are two ways you can do it. If you have a bunch of tomatoes to peel, drop them in a pot of boiling water for 30 seconds, then transfer to a bowl of ice water. The skin will slip right off. For one or two tomatoes, cut an “x” in the stem end of a medium-size tomato and microwave on high power for 30 seconds. When the tomato is cool enough to handle, peel off the skin. To seed a tomato, cut it in half horizontally and gently squeeze out the seeds. Homemade pizza with sliced tomatoes, basil, mozzarella and Parmesan; pan-fried noodles with beef stir fry; grill-smoked prime rib, baked new potatoes, sliced ripe tomatoes with mayonnaise and hot sauce; meatloaf, corn on the cob, little tomatoes eaten like apples. A crab cake slider, meatloaf slider, greens and beans at Arnie’s Public House in the Wallhaven area of Akron; fried fish fillet, coleslaw at Alexandri’s in Wadsworth; beef kibbee, meat fatayer at Our Lady of the Cedars’ Lebanese food festival in Copley; an Original Cuban Sandwich (pretty good) at Mi Casa Mexican restaurant in Hartville; a Southern Slaw Dog (Coney sauce and slaw) at the Copley Heritage Festival. Re: Jo Jo potatoes — I first encountered the thick, wedged, skin-on, deep-fried potatoes named “Jo Jos” at a Moscow, Idaho pizza joint while in law school at the University of Idaho in 1971. They were offered as an appetizer or side and served with sour cream (often with chives) for dipping. So no, Debbie C., they aren’t unique to Akron, my hometown, where I’d never seen them on any menu before 1971. Dear Cindy: Idaho?! Isn’t it enough that the state lays claim to baking potatoes? Must they steal our Jo Jos too? You mentioned line-caught salmon last week. The following group is out to educate consumers on where to buy fish. Mostly West Coast, but the video was put together by my daughter, Kyla Springer Yeoman for EdoTrust and Local Catch. 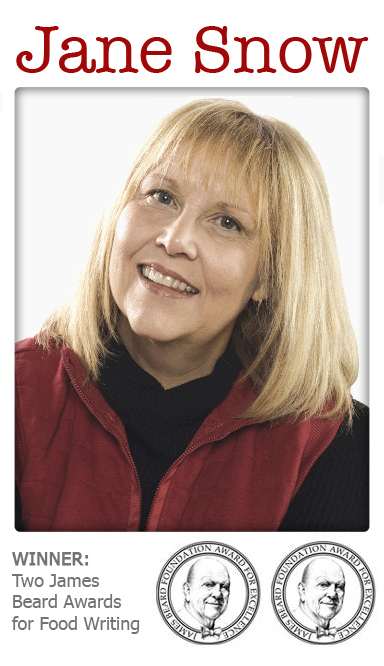 Dear Barb: Congratulations on having such a talented daughter. The organization, Local Catch, educates consumers about the eco superiority of “wild, sustainable, traceable, healthy” fish. The video (and the site) is worth a look. So far, no retailers in Ohio, but the list is sure to grow. I, and my dining companion, loved the Vietnamese meatball taco (at Bombas)! It’s hardly taco fare, but I enjoyed the flavors and the fresh crunch of the jicama slaw. To each his own, eh? Dear Martha: I am happy to print opposing views. I thought the flavor was OK, but my meatballs had an unpleasant, mushy texture. Sure you didn’t have a couple of mojitos before tasting? In my former life as a privileged food editor, I once got to taste salmon fresh off the boat, line-caught and served by a fisherman in Oregon. He laid four huge sides of briefly cooked salmon on a table. No seasonings, no sauces. As my cohorts and I tasted, he explained the differences in taste and texture between king (chinook), sockeye, coho and pink (and between line-caught and net dredged, wild and farm-raised). So when I say I prefer wild sockeye salmon, you can bet I have thought a lot about it. Not that my opinion is the last word; many salmon lovers prefer king, which usually is the most expensive because of its high oil content and silken texture. But I prefer the meatiness and mild but distinctive flavor of sockeye. With its brilliant reddish-pink flesh, it looks great on a plate, too. I was thrilled when I saw wild sockeye fillets in Sam’s recently. I bought an 18-incher, ate it, and went back a few days later for another. I was so happy I turned each salmon into an occasion. The first salmon was charcoal-grilled, drizzled with basil vinaigrette and served atop a Nicoise-like salad. The second was also grilled and served with a few lashings of horseradish mayonnaise and some ratatouille. Grilling may be the ultimate way to cook salmon. The smoke contributes to the flavor, and the bottom heat cooks the fish beautifully. You don’t need a fish basket or foil or anything else to cook salmon. Don’t worry about flipping it — that step is completely unnecessary. Just place the fish skin-side down over the coals, cover the grill and cook for about 10 minutes per inch of thickness. Most fillets will be under an inch thick, so subtract time accordingly. When the fish is done — to check, insert the pointed tip of a sharp knife vertically into the fish, pull aside some flesh, and see if the interior is opaque — simply slide a big spatula between the fish and the skin and lift it off the grill, leaving the skin behind. You may need two spatulas, working from each end, if the fillet is large and your spatulas small. I like salmon slightly underdone. I think the texture and flavor are best when it is not quite cooked through. Suit your own taste, but don’t overcook salmon or it will be dry and tasteless. 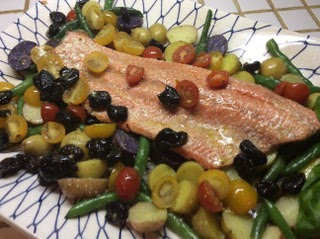 Use sockeye if you can find it for the following recipe, or if not, any large salmon fillet that weighs about 1 pound. A piece of fish that size, with the accompanying vegetables, will be enough to serve four. Drop the garlic cloves through the feed tube of a food processor while the motor runs. When finely chopped, remove lid and add vinegar, basil, salt and pine nuts. Cover and process, slowly adding oil through the feed tube, until dressing is smooth and creamy. Transfer to a lidded jar and set aside. In a medium saucepan, bring about 2 quarts of water to a rapid boil. Add beans and cook about 5 minutes, until just tender. With a slotted spoon or long-handled strainer, transfer beans to a strainer and refresh under cold water. Drain well. Add the potatoes to the same boiling water and cook until tender. Drain. Cut in half and add to the bowl with the beans. Add olives and tomatoes. Toss with 2 tablespoons of the basil dressing. Set aside. Build a charcoal fire in a grill. Pat salmon dry with paper towels. Place on a baking sheet, skin side down, and lightly oil top of fish with the olive oil. Season well with sea salt. When the coals have ashed over, spread them n a swath the size of the fish. Place fish, skin side down, over coals, adding soaked wood chips if desired. Cover grill, leaving vents open. Grill until salmon is barely cooked through, about 7 to 10 minutes depending on the heat of the coals and the thickness of the fish. While the salmon cooks, transfer the salad to a platter. With a large spatula (or two), transfer fish to the platter, placing it on top of the salad. Drizzle 2 or 3 tablespoons of the basil dressing over the fish. Sloppy Joes, potato salad, corn on the cob; avocado toast with two eggs over hard and hot sauce; pesto; grilled sockeye salmon with pesto ratatouille; high-protein chocolate ice cream; mojo-criollo pan-grilled shrimp in shells, gazpacho; warm leftover ratatouille with a poached egg on top; tomato and pesto sandwich; hamburgers on toasted, buttered ciabatta buns with Swiss cheese and sliced tomatoes. A chicken taco and a Vietnamese meatball taco (yuk) at Bomba Tacos & Rum in Montrose; fajita salad with beef at Tres Potrillos in Medina; Southwest chile-lime salad with smoked chicken at Panera; prosciutto and melon salad, mussels in a spicy tomato-caper sauce with grilled bread at Wolf Creek Tavern in Norton. The Saturday morning Seville Farm Market is one of my favorites. It doesn’t have the selection of a Countryside Farmers Market or Medina Farmers Market, but it is still worth the drive. It is small but mighty. The 10 or so booths set up in Maria Stanhope Park on Main Street last Saturday had so many treasures I came home loaded down. The purveyors, from either proclivity or necessity, are generalists. They each offer an array of items — say, a bag of three red-skin potatoes dug the day before, several heads of hard-stem garlic and a few baskets of peaches. Or a half-dozen turkey eggs, homemade tortillas, baggies of pizza dough, a couple of coffee cakes and an array of jams. The women purveyors are artisans. The jams I bought were brandied sour cherry and sugar plum with ice wine. I bought fresh homemade tagliatelle pasta, homemade English muffins, a homemade bagel and crusty bread. The women (there were no men) are mostly backyard farmers, and bring ripe produce picked or dug just before going to the market. I spotted an almond-shaped greyhound cabbage, and the two big heirloom tomatoes I bought were summer-sandwich worthy. Also, the prices are relatively low. If you have a great recipe for zucchini, the Aug. 12market is the one to visit. That’s when the annual Zucchini Smackdown will be held. For details about the contest and the market ( 9 a.m. to noonSaturdays), see sevillefarmmarket.blogspot.com. Thank heavens I didn’t have to take the citizenship test along with Tony. The U.S. Constitution was not written in 1837, as I wrote last week. It was written in 1787, a little more than a decade after we declared our independence from Great Britain. Thank you to Chris Myers for pointing that out, and a big thanks to everyone who sent congratulations to Tony for passing the test and becoming an American citizen. Thank you for the link to the list of authentic olive oils (not adulterated with seed oils or masquerading as extra virgin). Nice to see that the Carlini brand from Aldi is good! Dear Judy: Thanks for pointing that out. Now I know where to buy reasonably priced, authenticated olive oil. After looking at the NAOOA link you published in your last newsletter, it got me thinking about the olive oil I buy, a California-based EVOO from California Olive Ranch. The label on the bottle has a seal on it from the COOC, or the California Olive Oil Council. On the surface, it would appear to be a similar certification body, but for California oils. The organization’s site has information on the seal and the certification process, and a list of brands that sport the seal is athttp://www.cooc.com/seal-certified-oils/. Dear Tom: Yes, that is a certification offered just for California oils. I mistakenly omitted it when I wrote the item last week. Thanks for correcting my oversight. Darren B., how about spreading the Jo Jos word, too? It seems that Northeast Ohio is the only place you can find these little pieces of heaven. Dear Debbie: Hey, we have to keep some things all to ourselves.